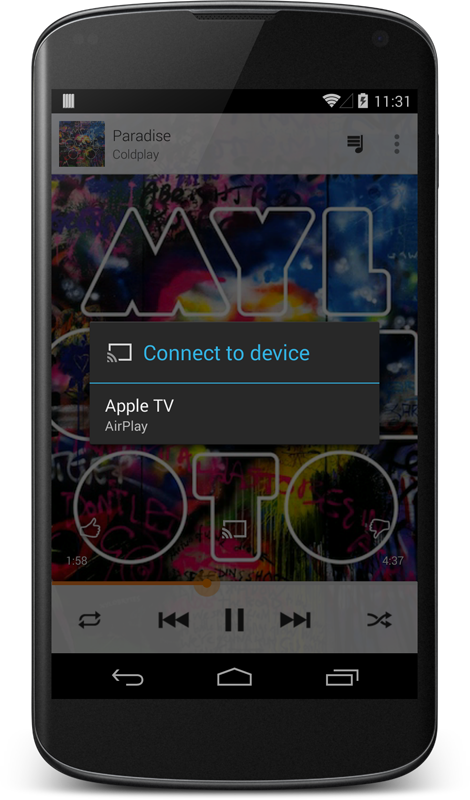 In Android 4.1 Google introduced a system-wide plugin API for streaming devices. Originally developed for the Nexus Q, Google now uses the API for their Chromecast device. The same API was also recently used by Sonos to enable the Google Play Music app to stream cloud music to Sonos devices. Today we released an “AirPlay for Android” package that adds an AirPlay music streaming plugin using this new API. Applications that take advantage of Android’s new plugin API automatically gain AirPlay music support when our plugin is installed. This includes Google Play Music, with one caveat: the Google Play Music app is currently using a whitelist and filtering out plugins other than Nexus Q and Sonos. If your device is rooted, we automatically patch the whitelist so that you can enjoy your Google cloud music on your favorite AirPlay device. Note that occasionally you may need to redo step #4 (Force stop) due to Google redownloading the whitelist from their servers.